United States President Barack Obama on Sunday arrived in Delhi on the second leg of his three-day visit to India. He was personally received by Prime Minister Manmohan Singh, who set aside protocol to welcome the high-profile guest. The US President shared an affectionate hug with Dr Singh. 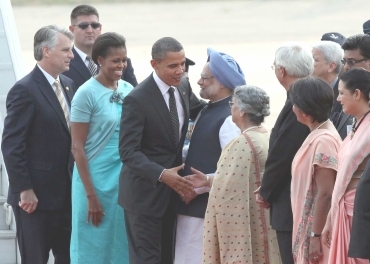 Obama greeted the PM's wife Gursharan Kaur with a peck on her cheek. First Lady Michelle Obama did the same to Dr Singh and Kaur. The prime minister looked visibly happy to see Obama, whom he had met quite a few times in the past, on the sidelines of various summits. The US President had hosted the first State Dinner of his administration in honour of Dr Singh in November last year. 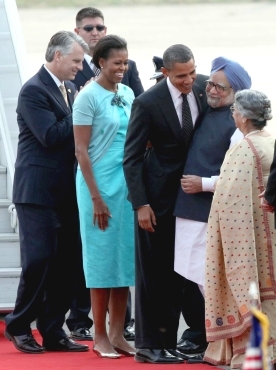 Obama has often expressed his admiration for his 'friend' Prime Minister Manmohan Singh. The US President had earlier described Dr Singh as 'one of the most extraordinary leaders' he had met and said he greatly valued the Indian leader's 'friendship, wisdom and decency'.